There are several senses of the word "liberal." One can be a liberal in the sense of believing that positive liberty comes from some sort of natural law, and that people have certain human rights that shouldn't be abrogated. One can be liberal in emphasizing negative freedom, i.e. freedom from government interference; this can take on an economic "free market" flavor or be even more broadly libertarian. One can be liberal in the sense of US political discourse, in which Democrats who, had they been in politics 40 years ago, would have been to the right of not only Nelson Rockefeller and Elliott Richardson but even Richard Nixon, are today called "liberal" or even "socialist." Probably only one of these senses applies here. Abe certainly isn't a liberal in the first sense. Witness, e.g., the proposed draft constitution promulgated by the LDP in 2012, the associated Q&A that decries the notion of natural human rights, and the opinions of the people whom he has elevated to the power positions at NHK. As for the "legacy" issue of the Special Secrets Protection Act, this could also properly be known as the "Lock Up Political Opponents as Terrorists Act," which is another use to which the law could be put, as hinted by LDP Secertary-General Ishiba during the debate on the law. In the second sense, Abe's credential are mixed. His proposals for getting women into the workforce aren't for women's empowerment, but for the sake of economic growth (which politicians of all stripes are bound to accept as an unquestioned Good Thing). His immigration proposals are similarly instrumental, for the sake of growth, not for providing a dream for the tired, sick, etc. His proposals for expanding daycare are not only numerically inadequate (according to Nakamura Noriko, the CEO of private daycare service provider Poppins, who contrasts the 400,000 slots proposed by Abe with the ca. 850,000 slots needed), but rely on expanding private daycare, rather than the government-subsidized variety. His exhortations to raise salaries are toothless, and in any case even if effective would do nothing to benefit the 30+% of the workforce who are non-permanent workers. So far, kind of liberal. But if his support for TPP is insincere, and actually is the passive-aggressive bargaining chip for negotiating leverage on defense issues with the US that it currently appears to be, then he is not so liberal as he might be. As for the final sense, here I think you're on safe ground. If a Democratic US President made such proposals, he'd be called much worse than a liberal. But probably the same could be said for many policy proposals of Marine Le Pen's Front National. 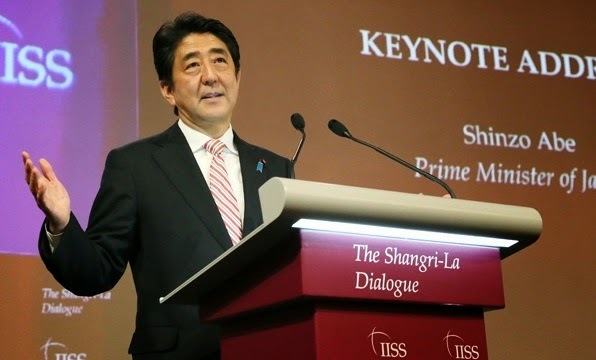 At best, Abe is Asia's standard-bearer for Beltway liberalism. > His immigration proposals are similarly instrumental, for the sake of growth, not for providing a dream for the tired, sick, etc. Of course those policies are for growth. That's what makes his program relatively liberal when compared the tepid economic policies of other governments, what with their aversion to fiscal and monetary activism. You say this as if it isn't in her interests to overstate the problem.